There are two new reports on the U.S. economy worth mentioning this morning. 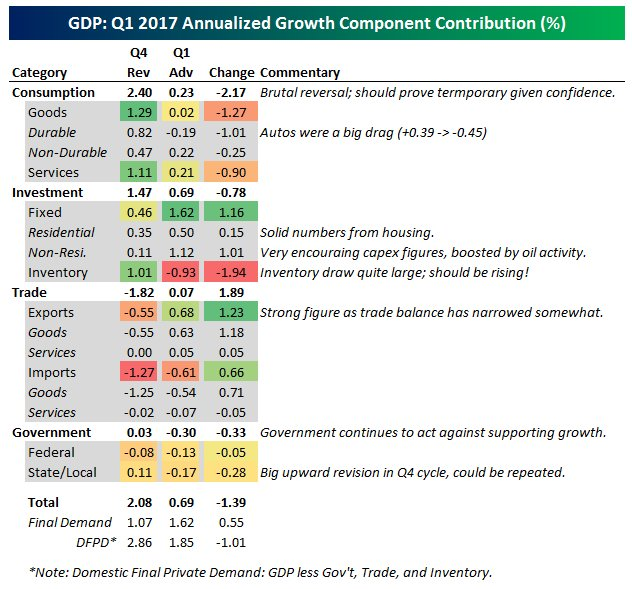 First, data from the Bureau of Economic Analysis (BEA) showed that U.S. gross domestic product (GDP) growth slowed in the first quarter of 2017. 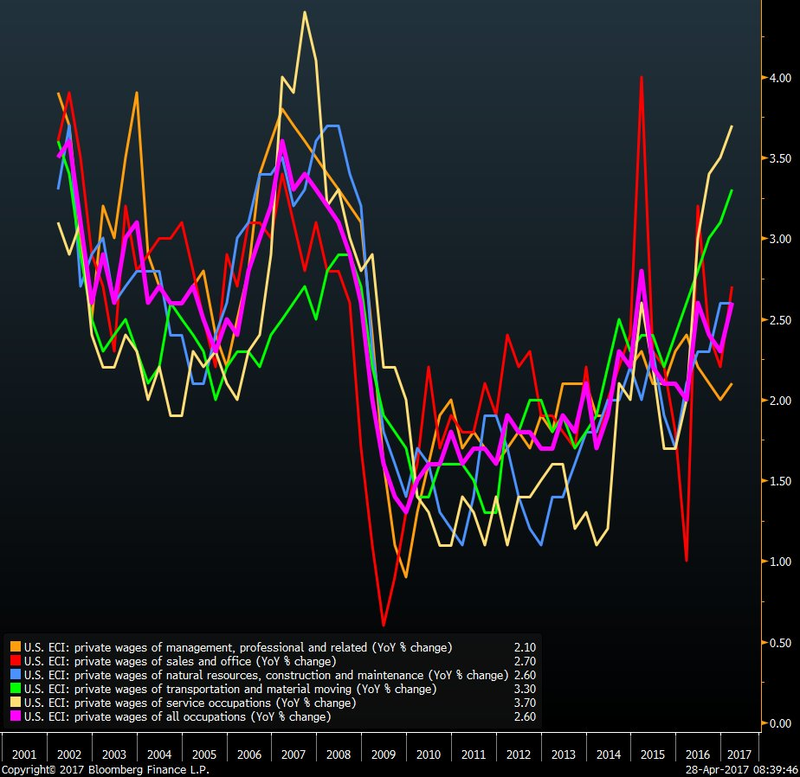 Specifically, real GDP, which measures the value of the production of goods and services in America adjusted for price changes (inflation), increased at an annual rate of 0.7 percent in Q1. 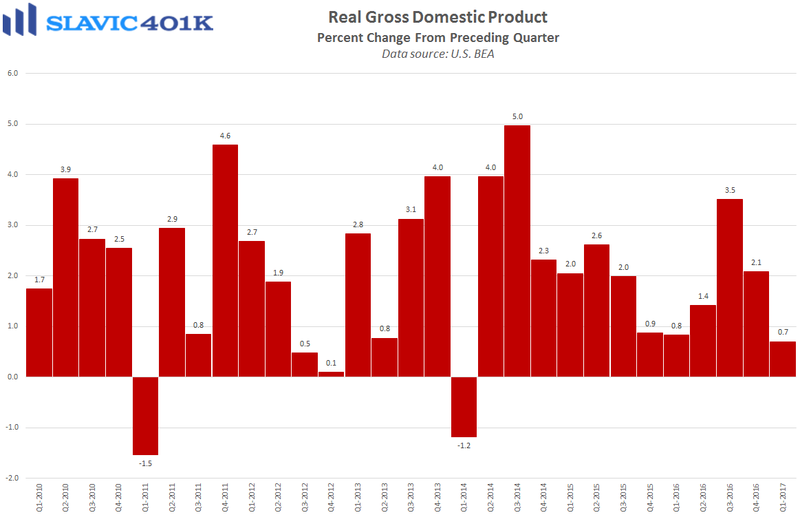 That was down from Q4 2016’s 2.1 percent pace of expansion, worse than expected, and the weakest quarter for economic growth recorded in three years. 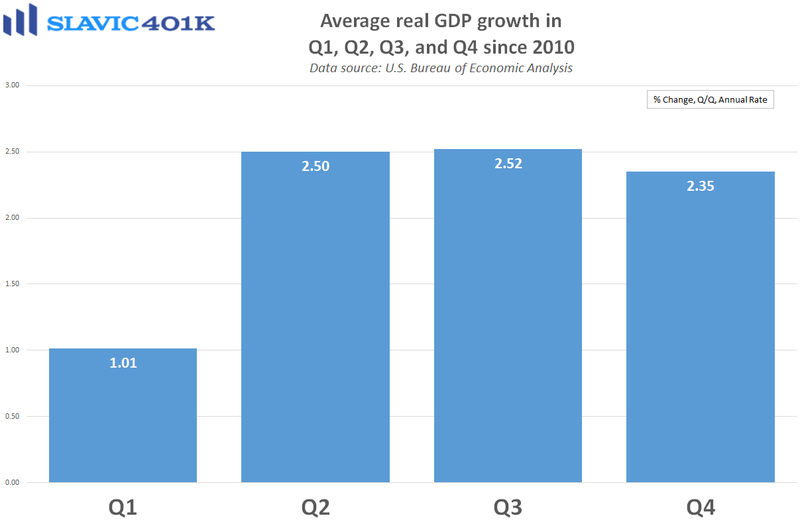 The biggest drag on GDP in Q1 was consumer spending, which accounts for more than two-thirds of U.S. economic output and grew by just 0.3 percent. 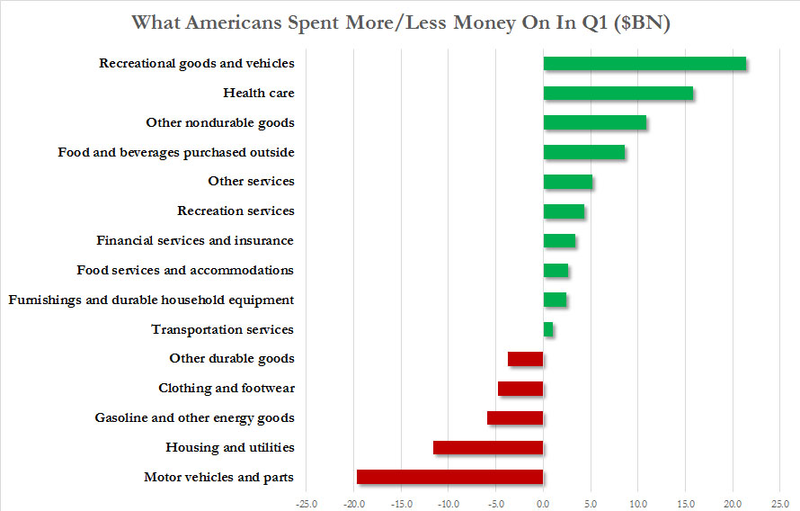 That was the smallest quarterly increase in personal consumption expenditures since 2009 but transitory factors might have played a role, e.g. an unusually warm winter weighed on utilities (home-heating bills) in Q1. 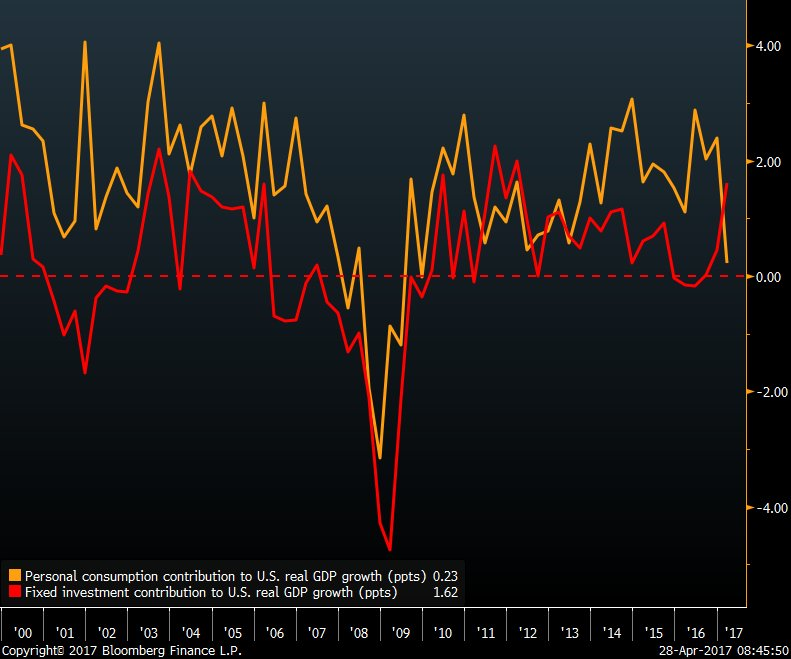 Further, private, fixed nonresidential investment continued to pick up in the first quarter, a sign of businesses boosting spending in anticipation of pro-growth policies from the new administration and Congress. 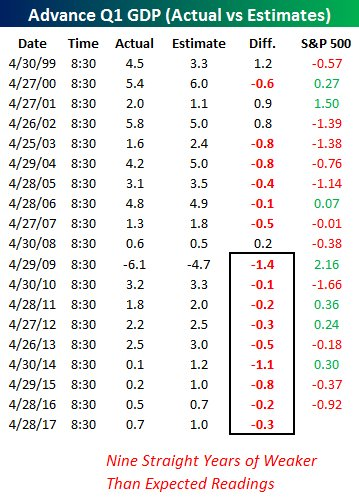 More importantly, it is worth remembering that this is only the first (advance) estimate of Q1 GDP growth, and it is therefore possible that the data will be revised much higher (or lower) over the next few months. 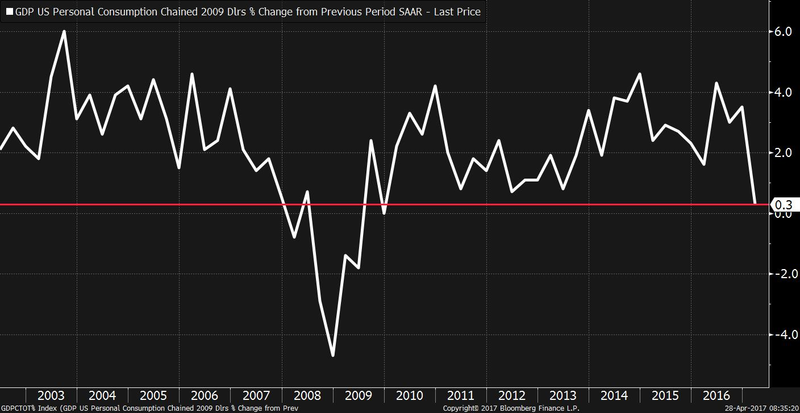 Overall, though, this report is in line with recent seasonality (second chart below) and suggests that the U.S. economy is still doing good but not great. Continued hiring, steady income gains, and greater business investment will all be needed for stronger growth down the road. Elsewhere, a report from the Bureau of Labor Statistics (BLS) showed that total employment costs (employer-paid taxes such as Social Security and Medicare in addition to the costs of wages and benefits) in America grew at an accelerated rate in the first quarter of 2017. Specifically, total compensation costs for civilian workers lifted by 0.8 percent in Q1, above forecasts and the biggest quarterly increase since 2007. 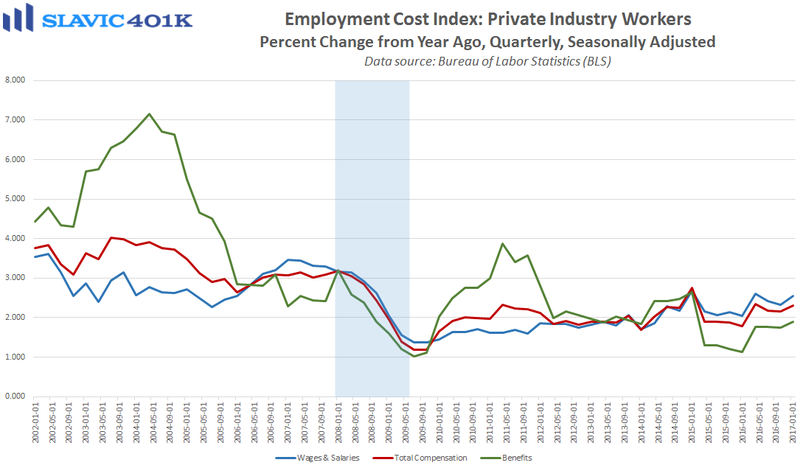 Wages and salaries, which make up about 70 percent of compensation costs, also lifted by 0.8 percent last quarter, while benefits rose by 0.7 percent. 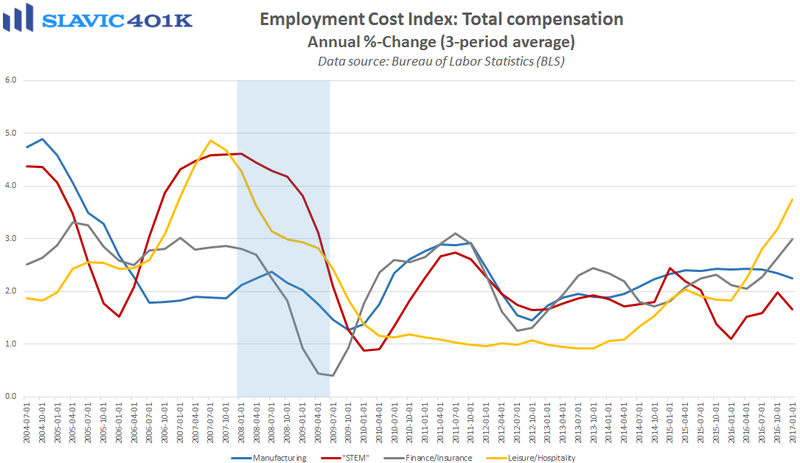 Compared to a year earlier, total compensation costs increased by 2.4 percent in Q1, up from the prior quarter but still below what has typically been seen during past expansions. 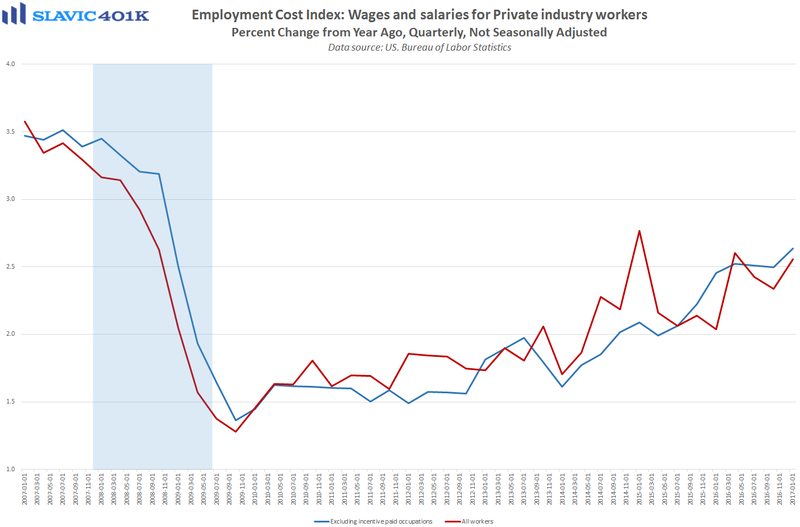 Similarly, the ECI excluding incentive pay rose 2.6 percent in Q1 (y/y), a new cycle high for private-sector wage growth but below pre-recession levels. 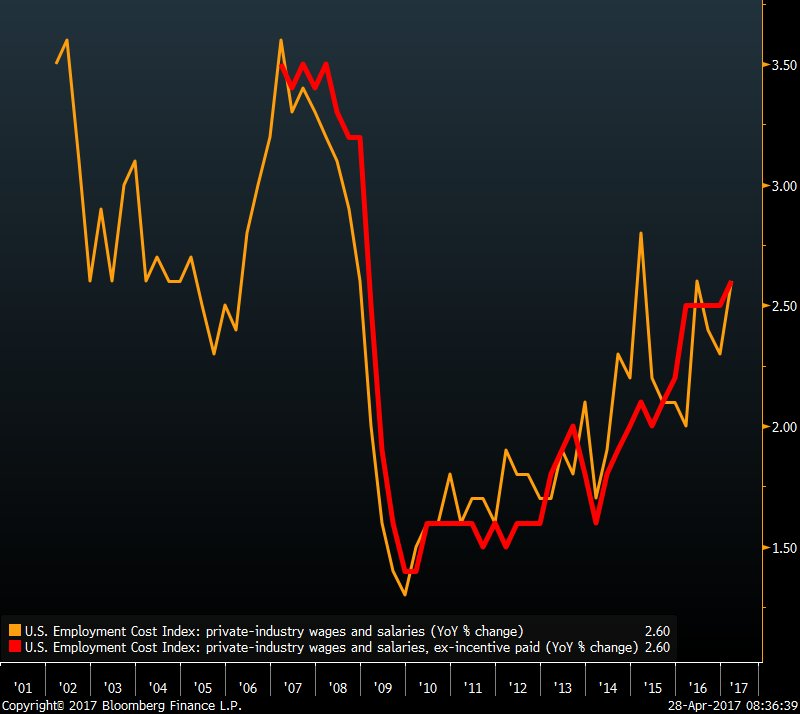 Going forward, the tightening labor market should continue to put more pressure on firms to boost employee compensation, which could be supportive of both consumer spending and inflation.